Future Generali India Insurance Company Limited (FGII), a joint venture between Future Group - the game changers in Retail Trade in India and Generali – a 186 years old global insurance group, has entered into a corporate agency tie-up for its products with UCO Bank, one of the Government owned commercial banks in India. Through the tie-up, Future Generali will offer its health & PA, motor, travel, home and rural insurance products across 3050 branches of UCO bank. K.G. Krishnamoorthy Rao, MD and CEO, Future Generali India Insurance Company Limited exchanged the Corporate Agency Agreement with Ravi Krishan Takkar, MD & CEO, UCO Bank on March 15, 2017. 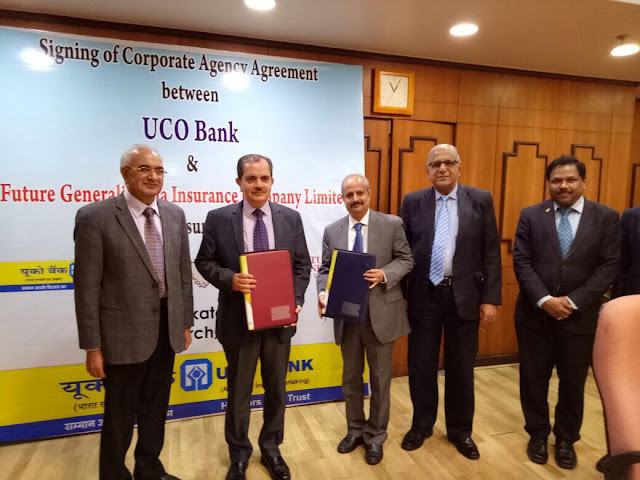 Anurag Sinha, Senior VP – Bancassurance and Zonal Manager – West, Future Generali India Insurance Company Limited said, “We are motivated to partner with UCO Bank and look forward to the journey to achieve our objective of servicing customers in both urban and rural areas. Through this association, we expect to cover 26 million customers of the bank and abide by our aim of offering the best products to the customers”. Currently Bancassurance accounts for 5% of Future Generali’s total business. Recently, the company tied-up with Bank of Maharashtra. Additionally, it has tie-ups with over 100 banks across the country. Strengthening business across all the partner banks coupled with the new association of UCO Bank, the company aims to achieve a growth of 80% by end of FY18. Future Generali India Insurance Company Limited is a joint venture between Future Group – the game changers in Retail Trade in India and Generali – a 186 years old global insurance group featuring among the world’s 50 largest companies*. The company was incorporated in September 2007 with the objective of catering to a country which was on the threshold of explosive expansion. Future Generali India has been aptly benefitting from the Indian expertise and network of Future Group and the global insurance insight in diverse product classes of Generali Group. It provides a comprehensive solution to customers and enterprises through retail, commercial, personal and rural product offerings. Having firmly established its credentials in this segment, Future Generali, effectively leveraging on the skill set of both its JV parents, has evolved to become a Total Insurance Solutions Company.